Jamie Stewart is a weird guy. Representing Xiu Xiu solo this evening, Stewart writhed on his stool as he manipulated the assorted synthetic and organic instruments in his reach. He has a theatrical delivery, expelling his mostly incomprehensible lyrics from his tortured soul, yet, when he finished, he didn't say a word to the crowd. He just wiped the sweat from his brow and started unplugging his gear, leaving you with quite the uncomfortable feeling in your gut. Swans picked up where Stewart left off. They walked onstage solemnly and positioned themselves in front of their drummer and a mountain of Orange amplifiers, with the Gibson Lucille and vocals of Michael Gira flanked by electric and bass guitar on one side and lap steel and percussion on the other. A string-based drone developed, with some added lap steel whining and bowed vibraphone, which carried on for about 10 minutes as Gira messed around with a pedal that, as came up again later in the show, was not working out. After what seemed like an eternity, Gira started singing, and eventually the band coalesced into pulses of thrashing. While the intro was awkward, the six-piece quickly found their footing in "Avatar" from Swans' recent record The Seer. Distraction turned to focus, as Christoph Hahn dialed in on his lap steel and Thor Harris worked tubular bells while bassist Chris Pravdica and guitarist Norman Westberg turned their energy toward Gira, who got so into that particular dirge that he sprayed spit straight up, on himself, for a few beats. There was no turning back after this. Gira got into character to the point of almost crooning "Coward" (from 1986's Holy Money), and later stomping along with his sparse strums. Hahn started flicking picks off his corner of the stage onto unsuspecting heads at regular intervals, and Harris made a heck of a racket joining Phil Puleo on his massive drum kit. It was hard not to get swept away by the waves of noise as they washed over you at such a volume, and it was not aimless noise. This was music to go to the desert and see visions to -- no pretenses, no oversold skill and no real dynamics outside of the realm of loud, undulating barrages of hypnotic sound. 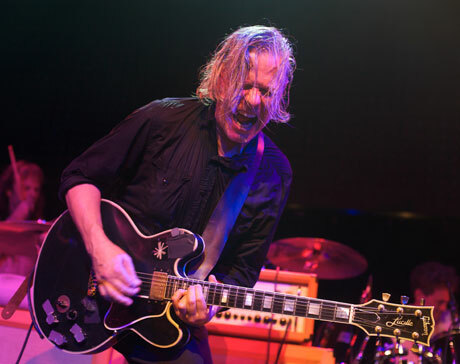 Unlike so many '80s/'90s band reunions, this incarnation of Swans is not a money grab. They have a purpose, and this was visible on all of their faces as they played.